onto the back of his open tray semi was a little spine tingling. I have had a delicious week of setting my home and studio in order. It all gets VERY out of control when I have deadlines with my work. This coming week I will be attending Clay Push in Gulgong for a week of inspiration. and there will be potters from around the world for this convention . 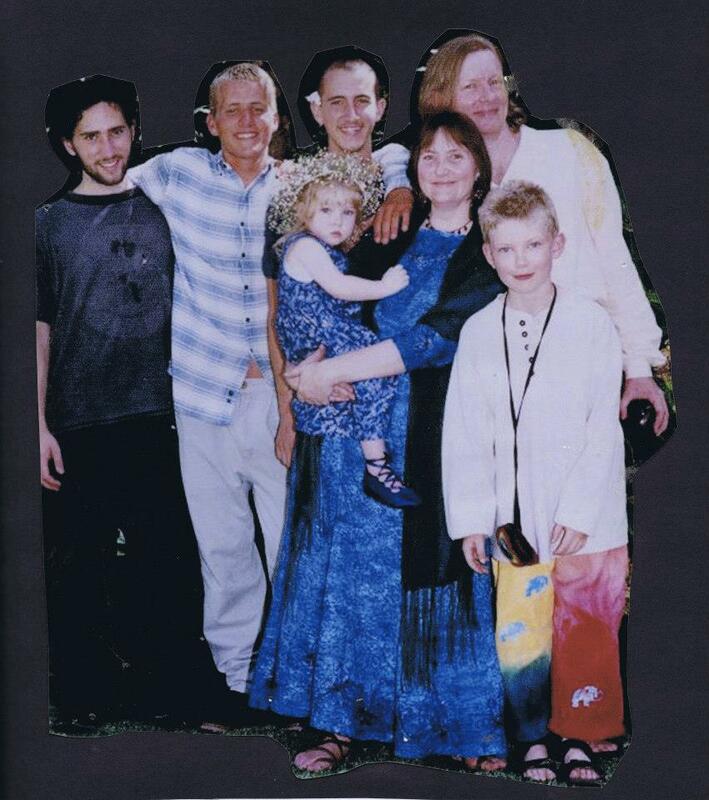 A true gathering of the clan. It will also be a time to meet up with some MUD COLONY members. Yes, look who I found today! Fresh from Melbourne, Mrs Adriana! YAY! And my sister, Karin, after a 12 hour bus trip from Wilcannia. so that I can delve into my clay full of inspiration. Well my WoW entry is now all ready for it's adventure. Monday it will be picked up and shipped out. I hope it is good enough to get through to the next judging. to look at the result with fresh eyes. "look at what you've got and not at what you expected to have"
I think I like it... but you never know if its what the judges will like or not. but unfortunately life didn't quite let me do much of it this time. apart from the classes , even when things don't go quite go to plan. AND found out about some really cool new materials...mmmmm! that celebrates living in the Blue Mountains. So now to get ready to go to Clay Push. My sister will be coming too! It will great to have some sis time, we have not had much time like this together. It is all a bit special. I AM BACK IN THE LAND OF THE LIVING! way too busy to write about it ....until now. I feel very fortunate to be an artist..........mostly. It doesn't pay well but I love it. Art gives me a great sense of my own space in my busy life. and transform it into a positive form. has taken the road that it has. So here is a little bit of my history. I grew up with a mum who was a painter/artist/art teacher. My dad loved to play the piano but he was not interested in art really. When I was born my siblings were 17,15 and 13. So they were almost like aunts and uncles in my early years and I looked at them in awe. My sister, Karin, is an artist and I grew up watching her and my mum at the easel painting. so mum created a bathroom that could transform into a darkroom for them. My older brother, Mike, was always pretty adventurous, getting into canyoning,kayaking,archery and more as a young person so it is not surprising that he is now the author of an amazing set of books that required him to walk the Kimberley taking photos of the land and the art. and an all round awesome person. At one stage in his late teens / early 20's his passion for his music was such that he had a grand piano AND an upright piano in his (only modest sized) bedroom and had to crawl under the grand to get into his bed at night. that he made as a 13year old.....haha so good. 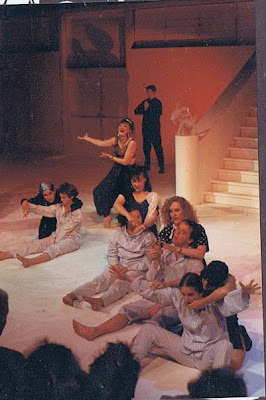 and a much loved and sort after piano teacher. It was a very creative environment! With all those awesome siblings to follow....What was I going to do when I grew up?! Well one thing I knew was that I was going to be ME and different from them. I didn't know how not to be creative, they had taught me well! When I was about 10 years old mum was teaching at a school in Sydney. that looks as though it had just come up out of the water. So it was at that moment that I decided that pottery was going to be for me. I started classes with Margaret Tuckson in 1975 on Saturday mornings and left school 1976 to work with her on more days as I couldn't get the art and chemistry combination I was wanting for the HSC. 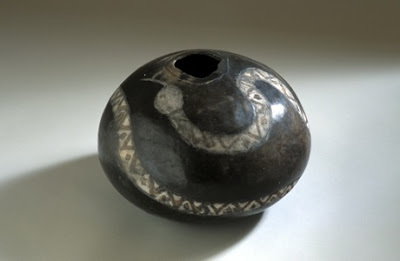 She encouraged me to get some more teaching from other potters to expand my practise and so I spent a year at Brookvale TAFE and then applied for East Sydney Tech in 1978 and submitted this pot along with some other wood fired pieces. However after being accepted I had to pull out as my first son was on the way. A growing family slowed my ceramic work down. I began making lead light windows. and commission work for stained glass windows followed over the next 10 years. and I found myself as a single parent needing a secure wage. So I did a B.A. 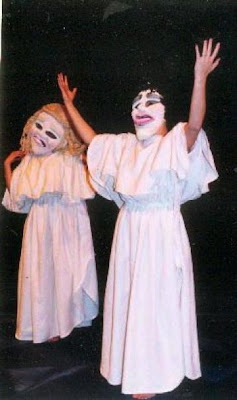 in Performing Arts with the aim to become Art/Drama/English teacher. Set design was a joy for me and it satisfied the inner artist in me. 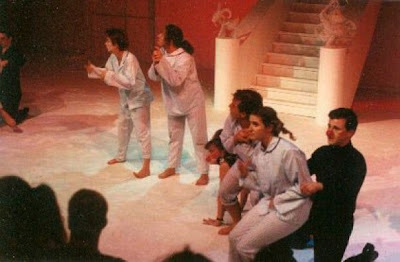 Yes, that is me with the pony tail and genie pants...hahaha...in a production of Kaspar. I made those wire animals you can see at the back on the posts too. Inspired by Picasso's Monkey and Goat sculptures. 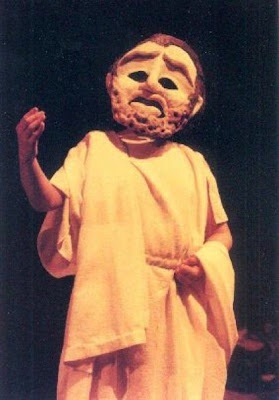 An interest in mask and costume developed during my degree. as part of my graduation year for a production of Antigone. and he generously taught me his mask making technique. 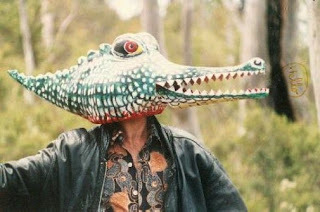 Here is Claude in one of his crocodile masks. so it's all connected really. 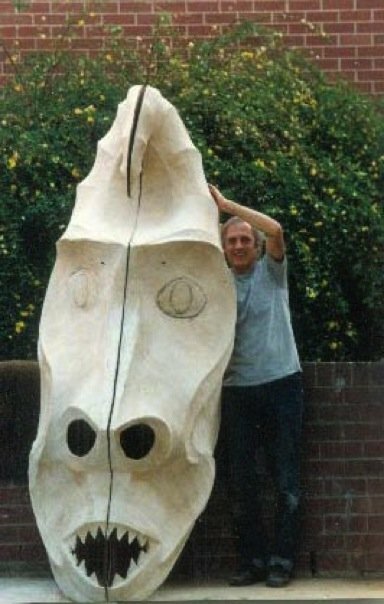 Claude uses a cardboard to sculpt with but for me it is always a return to clay. After uni I worked as a high school teacher and did a bit of stilt walking on the weekends. 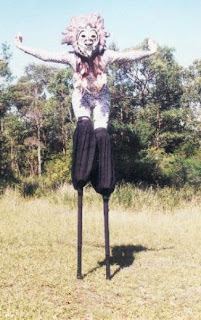 I was introduced to stilt walking by my dear friend Deb Lisyak. I had the joy of making several pieces of costume for her company Flair L'Gair. 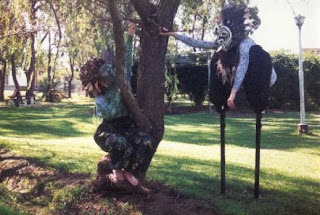 I thank her not only for teaching me to stilt walk but also for her approach to costume making. She had great integrity and a very high standard of workmanship in everything she made and everything that she commissioned to be made for her company. As time went by I met my now husband. He also had a son who was 5 years old when we met, so cute! So you see motherhood is a BIG part of my life.... my kids and my family are my inspiration! as my parents became elderly and one of my sons became unwell. Life was too full and I was not able to return to my work as a teacher. Art has become my life but it is along side and entwined into my family life. 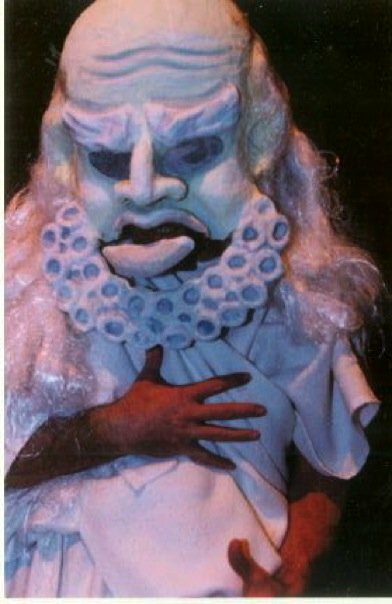 make costumes to appease my frustrated inner thespian and also room to make mixed media constructions to satisfy the recycler in me. and I am very much looking forward to spending the rest of the year potting. So that is me....at least for now. So why does a white Australian woman have a name like Sadhana? and became a swami by the time I was 19, Swami Sadhanamurti Saraswati! Yep ... shaved head...orange robes the whole thing. But things change and I decided it wasn't for me by the time I was 27 and left it all behind. However my name stays with me...I never felt connected to my birth name anyhow. So there you have it in a rather full nut shell. This blog post will be added to the Mud Colony Blog share site for all who love clay.